How to Enjoy a Car Trip with your Kids. 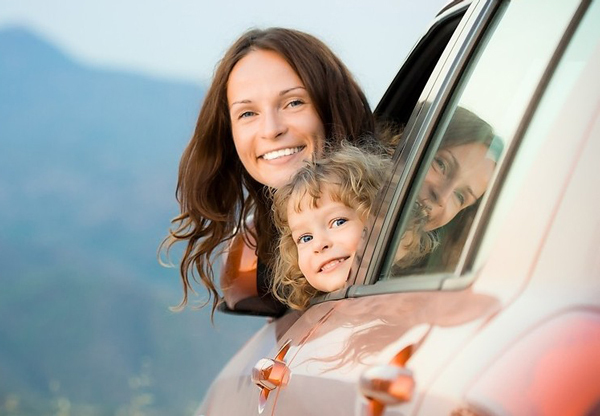 Are you going on a car trip with your kids? Your friends make you worry a little bit asking only one question “Are you crazy?”. But you have such wonderful memories of past car trips when you were a kid. So, now you want to take your kids on the best car trip ever, but how? Don’t worry! I’ll give you a few tips how to have everything under control and enjoy the ride. My number one suggestion is to never let your kids be starving. Pack up nuts, fruits, crackers, cheese, beef jerky or whatever they like. Also bring a plenty of water and soda. Do not ever travel without a big pack of baby wipes! It can come in handy when you clean your kid’s sticky fingers after eating snacks. And, of course, do not forget about sun cream, bug spray and also the first aid kit. You might think you don’t need these, but bring them just in case. Then you may think about your kid’s travel entertainment. For instance, everyone knows the alphabet game or car bingo. In order to make bingo more interesting let your kids make the bingo board by themselves. Let them write the words down they want in there. Older kids can write a travel diary. These diaries don’t have to be expensive; a simple notebook would do just fine. Engage them to write down places you go and impressions they have. In a couple of years they will read this diary with a smile on their faces. Create a music playlist that holds the favorite songs of the entire family. And sing them together like in a real rock band. Another fun thing to do is to give your kids a road map. It is a great time to teach them map skills which is an essential outdoor skill. You will be surprised if this is the reason your son becomes an geography tutor. Or let them just read the funny city names like Bee Cave, TX or Angels Camp, CA. Car trips can be an exciting time to your entire family and might even produce some of the best memories of this fabulous summer 2015. If you enjoyed reading this article you might also want to check out my other article about this summer 2015: “How to Have Fun with your Kids without Spending Money“. This entry was posted in summer break and tagged 2015, car trip, entertainment, family, fun, kids, summer. 4 Responses to How to Enjoy a Car Trip with your Kids. Thank you for sharing some great tips for traveling with kids. Baby wipes are definitely a necessity! Yes, baby wipes are a necessity. What I like most about the car trip article is Maya’s idea of a travel diary. Thanks!